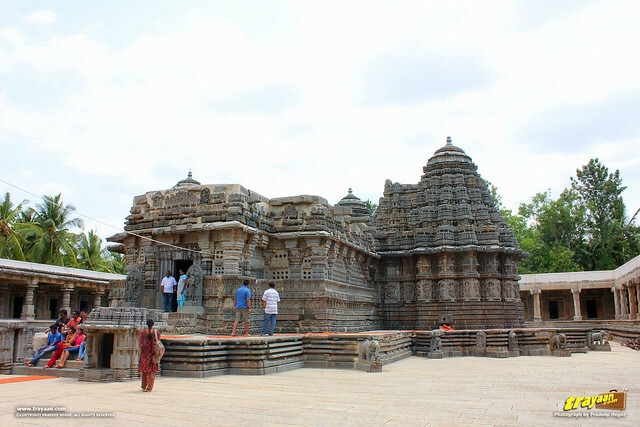 Keshava Temple at Somanathapura (a.k.a Somnathpur, Somanathpur, etc.) , just 36 km from the historic Mysore city in Mysore district, Karnataka, is an excellent example of the spectacular Hoysala style of architecture. 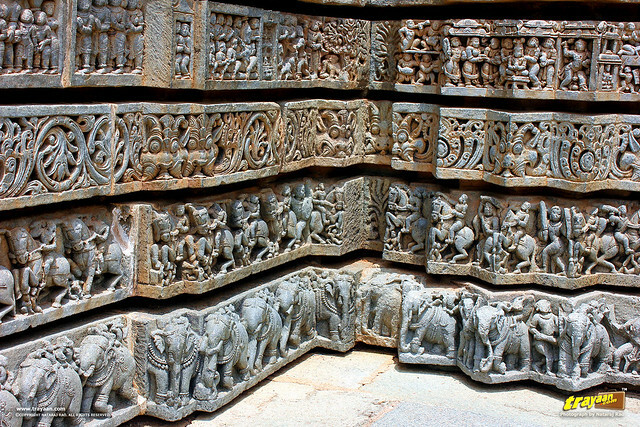 Full of intricate sculptures; beautiful and ornate carvings, pillars, lintels and ceilings, this magnificent work of art is one of the few well preserved Hoysala monuments. 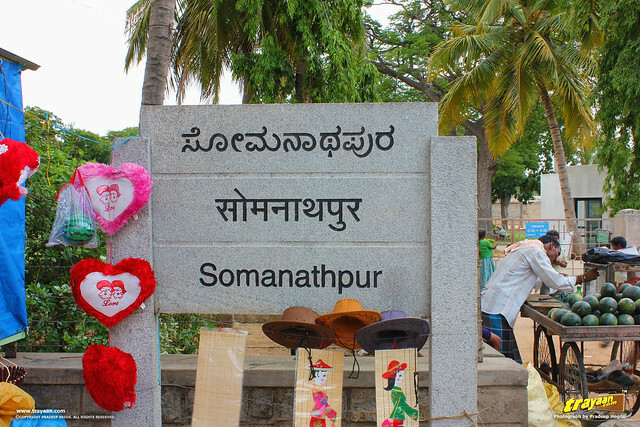 Somanathapura is also spelled as Somanathpur, Somanathapura, etc. “Keshava” is also spelled as “Kesava”. 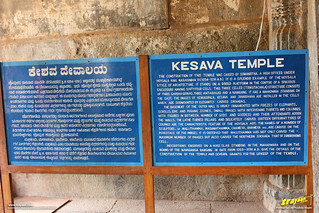 The information board put up by the ASI at the actual site describes it as “Kesava” temple. We will use the word “Keshava” in this article, as it sounds more appropriate for the pronunciation of the same. 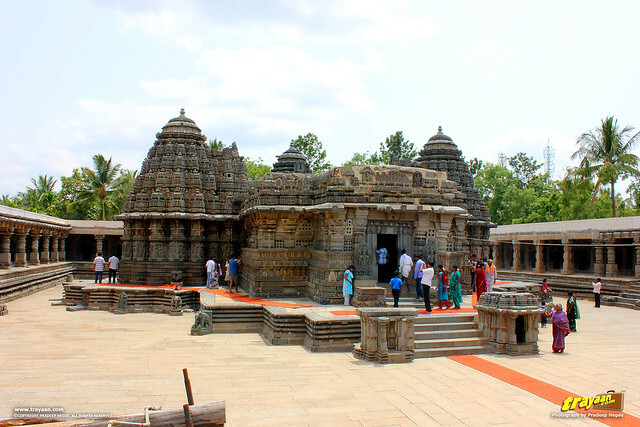 The Kesava temple of Somanathapura, which is said to be the last major temple of Hoysala dynasty, was constructed in 1268 CE, during the reign of Narsimha III (1254-1291 CE) by his illustrious general "Somanatha”. Somanathapura, meaning Somanatha’s town in Kannada, is named after him. 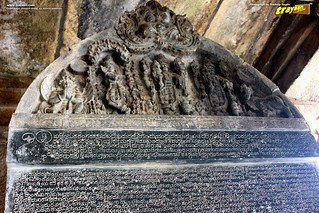 The stone slab with Old Kannada (Halegannada) inscriptions in the surrounding corridor, right inside the main entrance porch to the temple courtyard, gives details about the temple construction and upkeep. 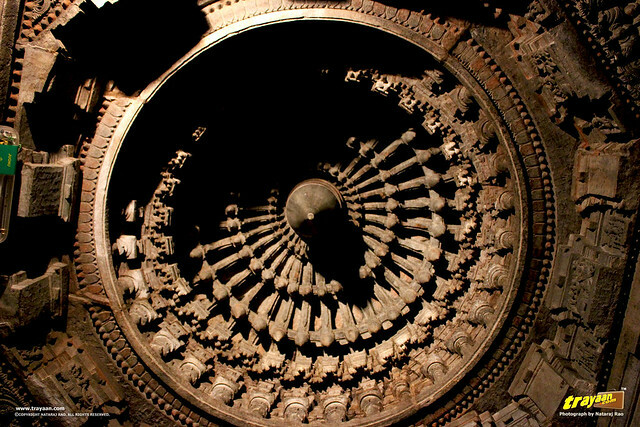 The Hoysala era is a significant period in South Indian history, with exceptional developments in art, architecture, and religion. 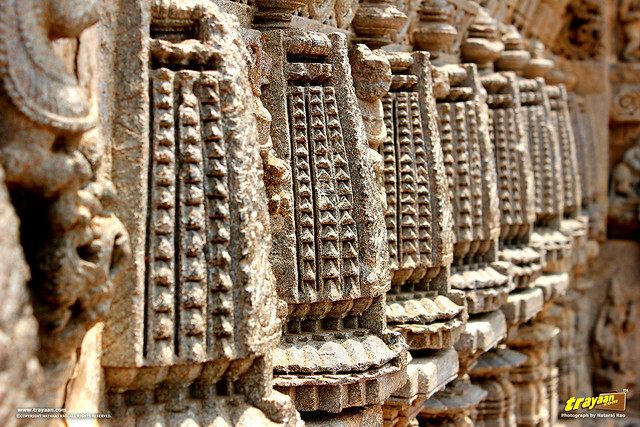 All that remains today of that great empire are its beautiful and intricately designed temples. 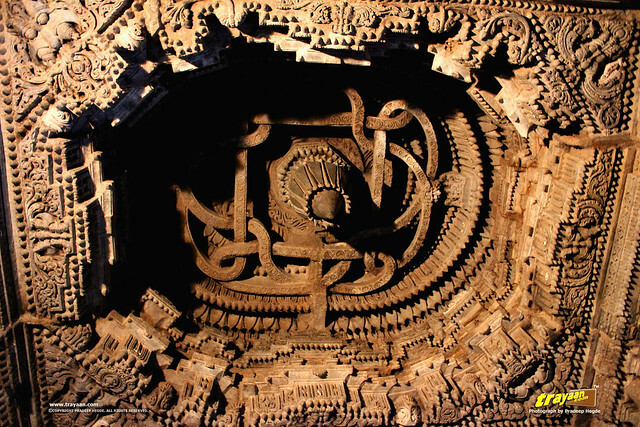 A protected monument and a national heritage, the temple is now maintained by the Archaeological Survey of India (ASI). 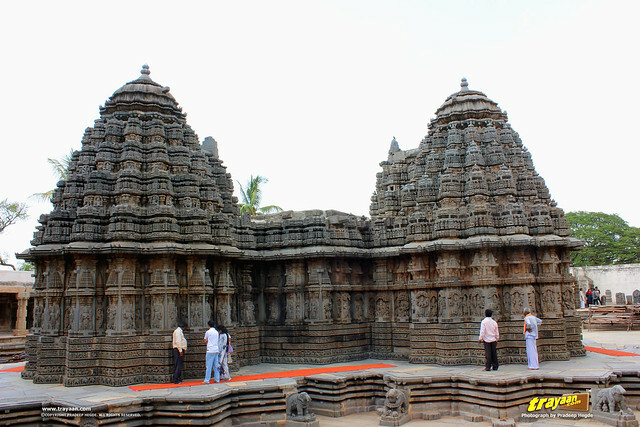 According to IGNCA, The Keshava temple of Somanathapura is the best-preserved monument of Hoysala architecture. Last year, during our Mysore visit, we took an excursion to Somanathapura. A small village , seemingly nothing out of the ordinary, houses the splendid Hoysala styled architectural marvel, the Keshava Temple. 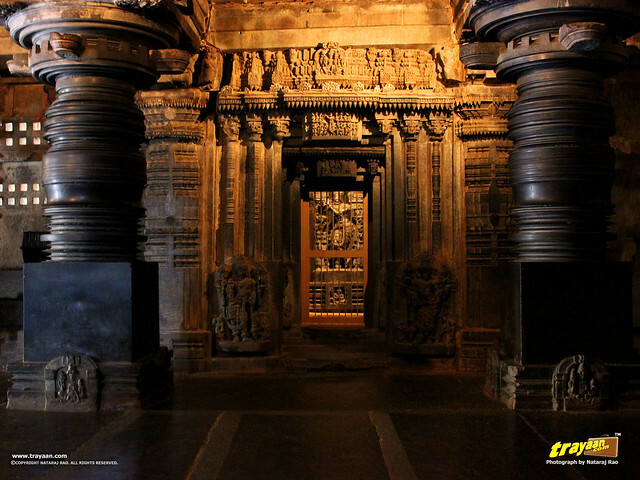 With excellent craftsmanship, exceptional and intricate carvings, design and style, Hoysalan temples are all spectacular works of art. Every available space, of the temple structure, like the walls, pillars, ceiling, entrances, windows, lintels, almost everything is adorned by ornate designs and beautiful sculptures. 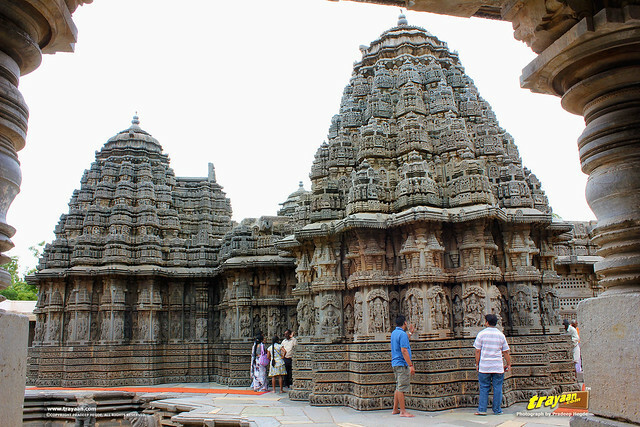 Keshava temple of Somanathapura is a splendid gem of the wonderful Hoysala architecture. Taking an entry ticket of Rs. 5 of ASI (Rs. 100 For foreigners), at the gate, keeping our footwear out at the stand, passing by a Manasthamba (pillar), we entered the temple courtyard, through the main door, the only entrance to the high walled enclosure. 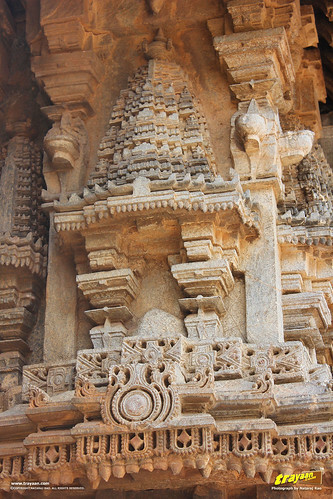 Once entered into the high-walled temple courtyard surrounded by a cloistered corridor with a colonnade open to the inner side, in the center was one of the finest examples of the magnificent Hoysala architectures, the Kesava Temple, with three Shikharas (Peaks, or Spires). These three shikharas correspond to the three shrines (Sanctum-sanctorum or Garbhagrihas) of the Hindu deities inside the temple. 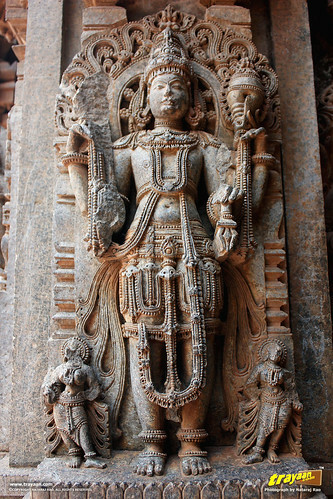 Most part of this temple is well preserved, except for a few defaced or ruined sculptures, thanks to invaders, negligence and obnoxious vandals over the time. As usual, let me keep the words less, and let the pictures speak for themselves. The entire temple is built on a beautiful star shaped platform, possibly used for pradakshina (circumambulation of sacred places in Hindu or Buddhist context). 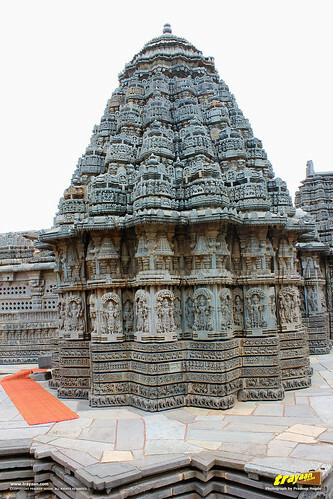 Such star shaped platforms can be seen in other Hoysalan temples, for example, in Belur. 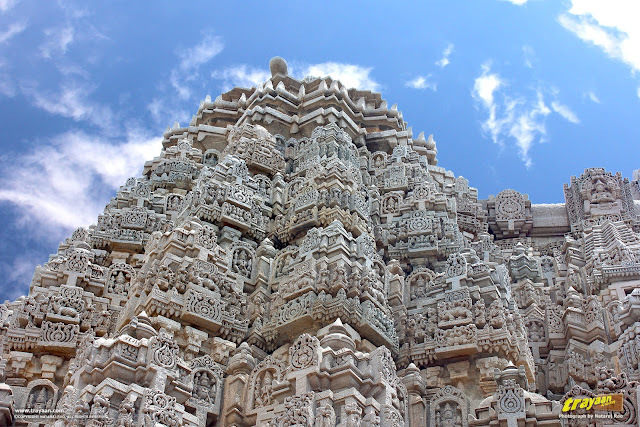 The temple walls and peaks are adorned by beautiful sculptures of various images, Hindu deities, scenes from the ancient epics Ramayana and Mahabharata, and other puranas (Hindu mythology, legends and folklore) and other themes. 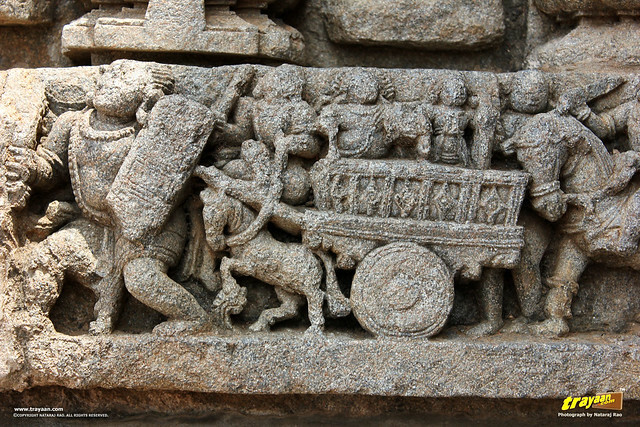 The stories in sculpted images are in a clockwise direction, the same as the direction of a pradakshina. 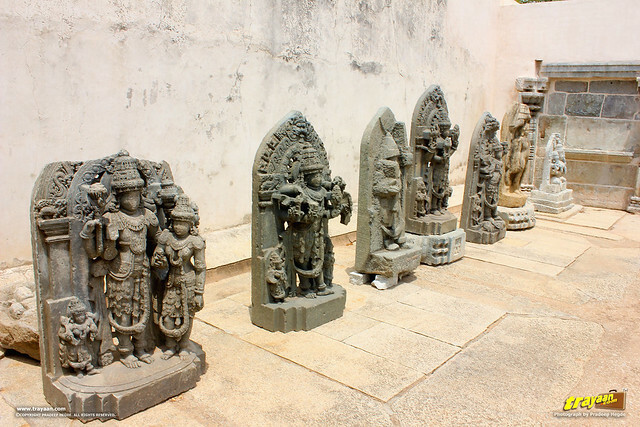 The sculptures are said to bear the name of “malli”, for Ruvari Mallitamma, who was a prominent and well known sculptor of the time. 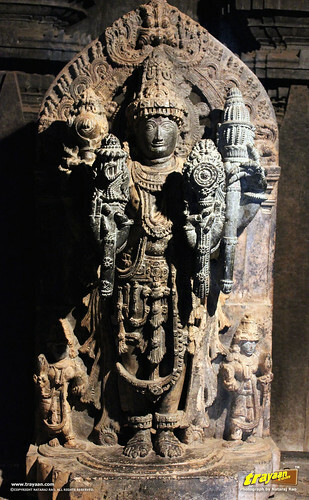 He has many hoysala styled sculptures at several temples attributed to him. The signboard at the temple says, the names of a number of sculptors, Mallithamma, Masanathamma, Chameya, Bhameya, etc. are carved on the pedestals of the images or sculptures. 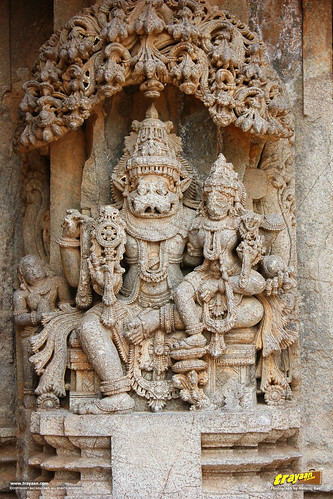 It further states that Mallithamma has carved the maximum number of sculptures, and also the northern shikhara of Lord Janardhana cell. The temple is a trikutachala (a three celled structure), with the three sanctums or shrines connected by a vestibule. It has only one entrance to the east. 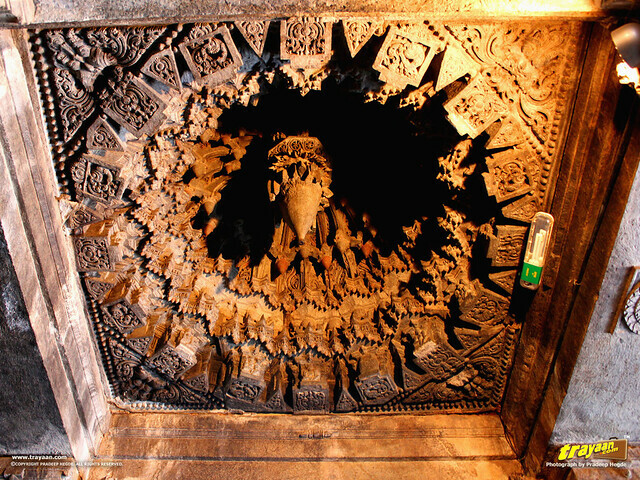 On entering inside, the main idol of Lord Keshava or Chennakeshava is visible straight ahead, in the main shrine or sanctum sanctorum, which is the west shrine. On the two sides, left and right, are two other shrines or sanctums, with idols of deities. The northern shrine has the idol of Lord Janardhana and the southern one has the idol of Lord Venugopala. The three Shikharas (Peaks) you see from outside are for these three shrines inside. All these three small shrines are adorned by intricately carved lintels and entrances. 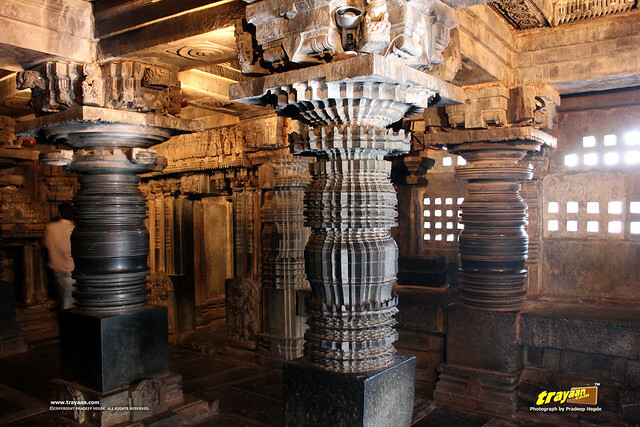 The lathe turned pillars, which are a typical feature of Hoysala temples, are some of the finest. 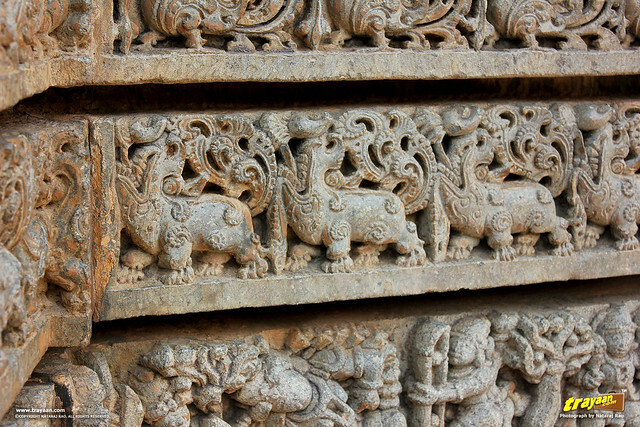 Then there are beautifully carved rock “windows”, you see in most Hoysala temples. 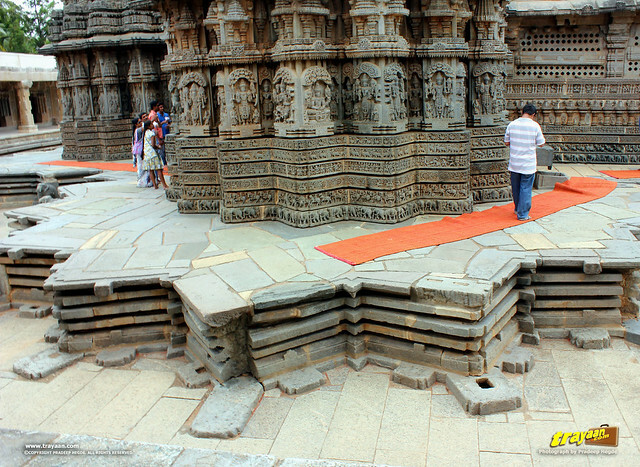 As in Belur, Halebeedu and other typical Hoysala styled temples, there is a circular raised platform on the floor, at the centre of the vestibule. When you are inside, do look up for the ornate ceilings, which are all spectacular works of art! 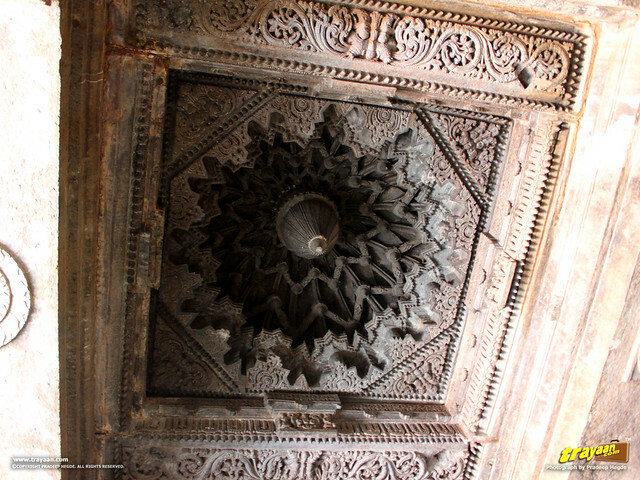 There are totally sixteen delicately carved ceilings inside; each one of them ornate, with a different design. 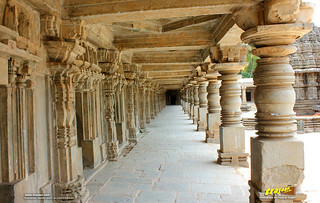 The entire temple is cloistered, surrounded by high walled corridors. In this cloister, surrounding the temple, there are several chambers, which might have housed several idols of deities. Some renovation work was going on at the time, and some idols were kept outside. 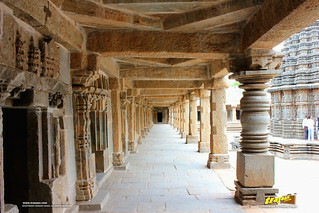 If you notice the pictures, you can observe that the southern colonnade of the cloister completely has the typical Hoysalan lathe turned pillars. But however, the northern colonnade has only some of such styled pillars. The rest are simple pillars. The west colonnade has only one lathe turned pillar, and rest are simple ones. It is improbable for this kind of asymmetry to exist in such a planned architecture, and might be a result of renovation work. Enthralled by the magnificent architecture, we headed back. This is a must visit, if you are visiting Mysore, and if you are a fan of excellent historical architecture, or even if you simply are a tourist. 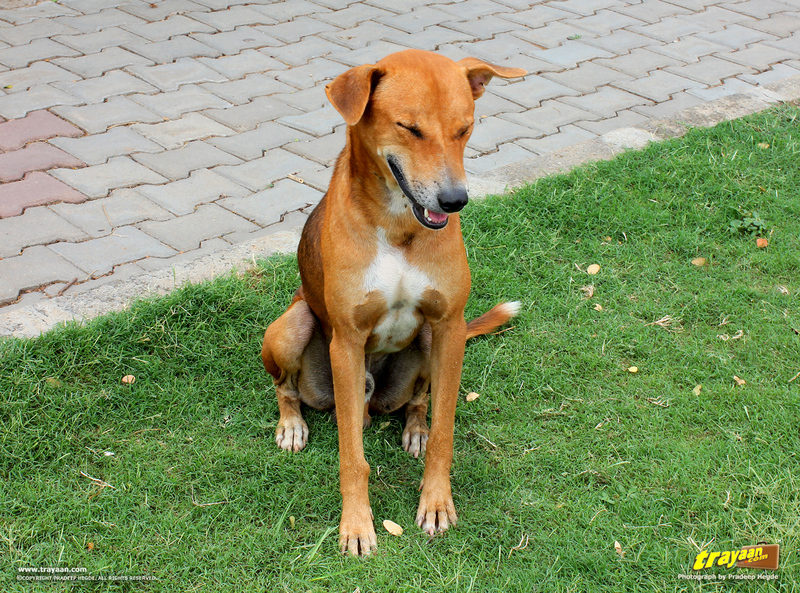 A nice doggy in the premises. For a moment, I thought he was meditating. Even though there is no ongoing active worship in this temple, footwear is not allowed inside the temple complex. You will have to leave them out at a stand outside the temple complex. 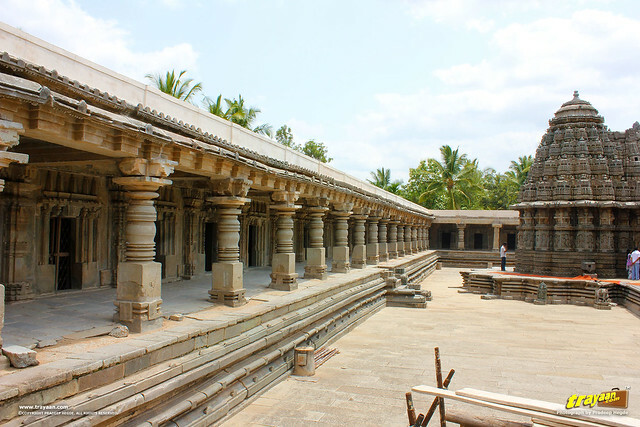 Somanathapura is also called and spelled as: Somanathpur, Somnathpur, etc. “Keshava” is also spelled as “Kesava”. In Wikipedia and Google Maps, this temple is mentioned as "Chennakeshava Temple" or "Sri Chennakeshava Temple" of Somanathpura. But the board put up by the ASI at the actual site describes it as “Kesava” temple. Hiring a cab or some 4 wheeler is a good option, as you can easily cover other nearby places of attractions worth visiting. There doesn't seem to be much buses to Somanathapura. 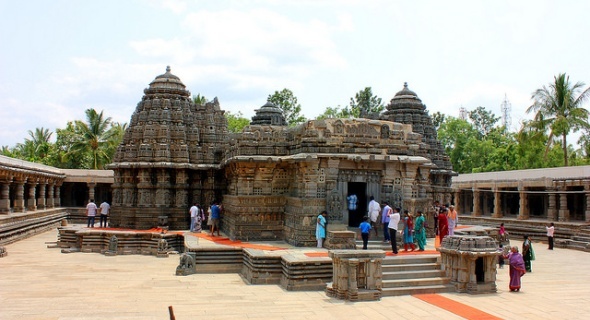 There are many tourist bus services from Bangalore and Mysore, and it can be enquired whether Somanathapura is one of the places of visit during the tours. There aren’t any great joints of food here, just a couple of small eateries. If you are coming from Mysore side, better have it there itself, or on the way. If you are coming from Bangalore side, there are lots of places offering great food on the Mysore road. You can try the famed “Maddur Vada” in Maddur, Mandya district as well! There aren't any accommodations in Somanathapura. One can stay at Mysore (which is ~ 36 kms away), which has plenty of accommodations and many other worth visiting places of interest. Other option is to stay at Bangalore (~ 130 kms away). Winter, and just after the rainy season gets over (that way, there will be more water in the nearby Shivanasamudra waterfalls). Better visit in the morning, to avoid walking barefoot on the hot slabs. Mysore, the historical city, is ~ 36 kms away from Somanathapura. Have a look at the above map, where we have added some of the Places of interests in and around Mysore, for your convenience. We will eventually add the places to the map which aren't listed currently. Its better that you make a travel plan including your desired places, suiting your time and interests so that you can cover other places on the same day itself. A Complete Guide to Hoysaḷa Temples By Gerard Foekema, Abhinav Publications, 1996. ISBN 8170173450, 9788170173458.